We never really have been happy with the layout of Station 42. It always felt a bit too linear and didn't really feel like it had enough buildings. Another issue it had was that there were really no places to land space ships except the edges of the board and a few random spaces in the middle which also served as roadways. The roadways themselves were very open and long creating long and wide lanes of fire which didn't feel very "urban" in nature. One of the ideas we had when we did the initial set up was that since most of the building were on stilts they could be easily moved with cranes or VTOLs and placed in other configurations. Another idea we had was that the station could be expanded on with more buildings and other structures. So this is the rough layout of what we are doing now in phase 2 of the project. We now have three large landing pads made from cork tile that I am going to spray pain black dusted with grey to make an asphalt look. Each landing pad will get a warehouse/office which are shown here using some random buildings from our other terrain sets. We will be building custom buildings for this purpose ASAP. We will also be adding 2-3 inch high modular walls around each of the landing pads as we have time to produce them. We also added some tarmac under many of the buildings to give it a more finished look and make the roadways more apparent. The smaller adobe buildings will be used as small shops and will get removable signs. I'm considering making all new shops but I already have these and their construction style ties them into many of the surrounding locations. I also like the variety they give the station. There are also three smaller landing pads. One in front of Rosie's workshop. One at the Venture Star complex and one that you can see in the upper right on the table. 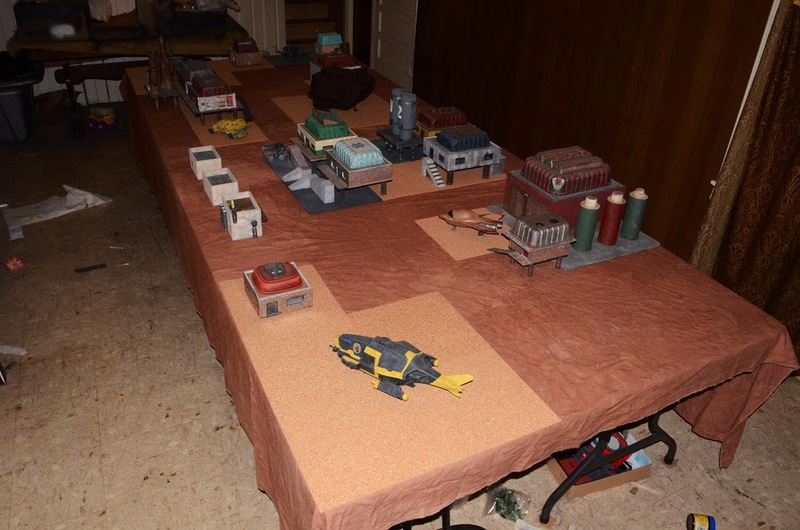 We may also add one in the lower right of the table but for now that is going to be the Hell Knights occupation base. The base will start as a camp but be expanded into something more substantial. The Hell Knights will also be occupying Rosie's workshop as well as making use of the landing pad in the lower left corner of the table. We may also remove the NOVA security station and replace it with civilian parking spaces or simply convert it into another business. I think this layout is far superior to the one we have been using for the station. It is not only more visually appealing it should provide more interesting play. In story the idea behind these changes is that Smith and Wilson Agriculture have purchased Station 42 and have made several upgrades to the facility. The Hell Knights have also become the new security contractors for the station. NOVA Securities has been fired by the new owners and Rosie has fled the station after she aided the rogue Planetary Guard forces that were defeated in the "Battle of Station 42". Smith and Wilson began making these changes shortly after the battle.